DNS Security Extensions (DNSSEC) is used to validate the integrity of DNS responses as authoritative servers provide digital signatures in addition to the standard DNS data. Using asymmetric key cryptography, each DNSSEC enabled zone will use two keys. The Zone Signing Key (ZSK) is used to sign DNS records within the zone. The Key Signing Keys (KSK) is used to sign the Zone Signing Key. The ZSK is a short-term key and is rolled over frequently while the KSK is a longer-term key and is best practice to roll over once a year. The Delegation Signer (DS) record is a sample of the KSK and is provided to the parent zone. The parent zone in turn signs the DS record to create a chain of trust. To enable DNSSEC for a zone on the Ecessa appliance, log into the web interface and go to the Authoritative DNS page. 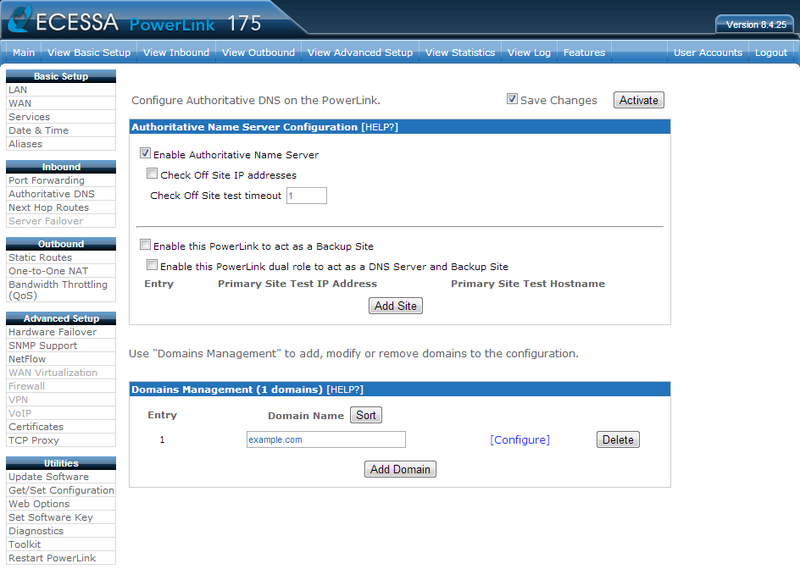 Click the Configure link next to the name of the domain. The DNSSEC setting is located at the top of the domain configuration page. Click the check box to enable DNSSEC and then click the Activate button. After clicking the Activate button, a text field will display the generated KSK for the zone. DNSSEC is now enabled for the zone.